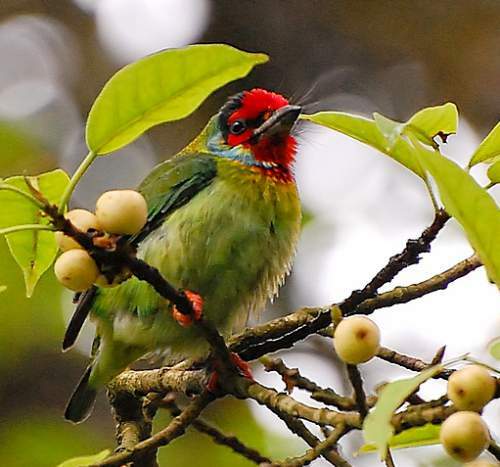 The Malabar (crimson-throated) barbet (Psilopogon malabaricus) belongs to the family of Asian barbets, the Megalaimidae. The Malabar barbet species is endemic to the Western Ghats in South India. These barbet species nest in holes excavated on the underside of tree branches. These barbets are monotypic species. The Malabar barbet (Psilopogon malabaricus) is a small Asian barbet, measuring 15 to 17 cm in length and weighing 35 to 40 grams. The Malabar barbet has overall green plumage. The upperparts are dark green and the underparts are pale bluish or yellowish green. The forehead, face, chin and upper throat are red. There is a black eye stripe. The crown is black. The sides of the neck have blue patches. The hinderneck and upper breast have yellowish orange patch. The undertail coverts are very pale green. The undertail is grayish. The bill is dark gray. The irises are dark brown. There is a gray eye-ring. The legs and feet are reddish. The call of these barbet species is a metallic "tuk…tuk…tuk" sound. The Malabar barbet species are endemic to Western Ghats in South India. They are distributed in the states of Maharashtra (south), Goa, Karnataka (west), Kerala and Tamil Nadu (west). These Malabar barbet species have moderate forest dependence. They normally occur in altitudes from 0 to 1300 meters. 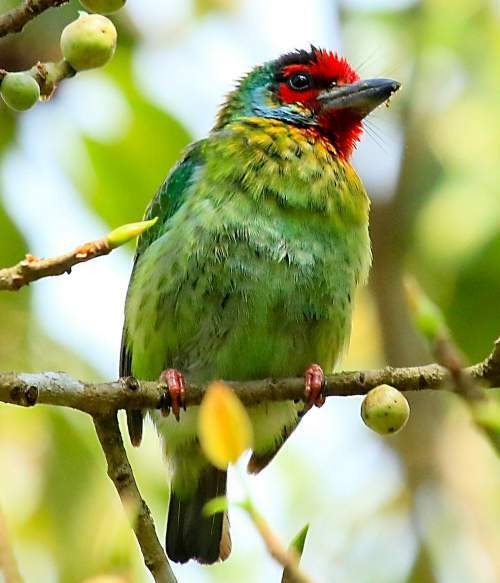 The artificial ecosystems and habitats of these barbet species include cultivated lands, rural gardens, plantations, orchards and coffee estates. The natural ecosystems and habitats of these species include, evergreen forests, forest edges, tropical and subtropical moist lowland forests, wetlands, rivers, streams and creeks. The diet of this Malabar barbet consists mainly of fruits. Wild fruits, plantation fruits, berries, coffee berries and figs are their primary food. These barbets are known to feed on grubs, small insects and larvae, airborne ants and flying termites. The breeding season of these Malabar barbet species is from December to May in most of their range. The nesting sites are the holes in tree branches excavated by the breeding pairs. Nearly 50% of the pairs raise second brood after the first brood has fledged. These species are monogamous and highly territorial. The clutch usually contains two white eggs. The parents incubate the eggs. The chicks hatch out after 14-15 days of incubation. The chicks are initially fed with insects. They fledge in about 35 days. These Malabar barbet species are non-migrant, resident birds. They disperse locally after breeding. The populations in higher altitudes descend to the lower levels in winter. Post breeding, the juveniles may disperse and establish in new locations within the range. Within their range they may make local movements for feeding and breeding. The global population size of the Malabar barbet (Psilopogon malabaricus) has not been quantified. The overall population trend of the species is considered to be decreasing. In most of its range, this species is reported to be locally common. The generation length is 8.5 years. Its distribution size is about 149,000 sq.km. 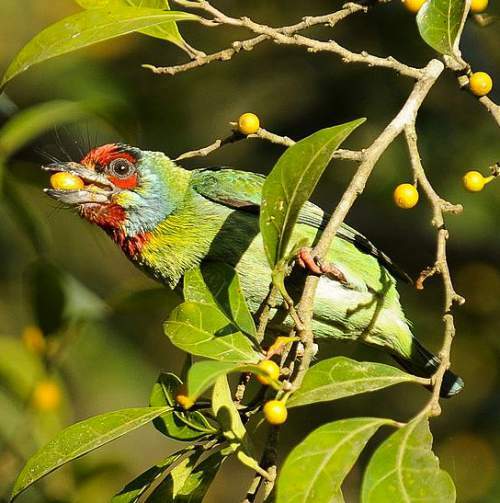 Habitat alteration and destruction, felling of trees suitable for nesting holes, predation of eggs and hatchlings by large birds and rodents are the main threats that are endangering the survival of these barbet species. The Malabar barbet (Psilopogon malabaricus) does not approach the thresholds for being Vulnerable either under the range size criterion, or under the population trend criterion or under the population size criterion. The CITES (Convention on International Trade in Endangered Species of Wild Fauna and Flora) status is ‘Not Evaluated’ for Malabar barbet (Psilopogon malabaricus). The Malabar barbet (Psilopogon malabaricus) is closely related to the crimson-fronted barbet (Psilopogon rubricapillus) and the coppersmith barbet (Psilopogon haemacephala). Current topic in Birds of India: Malabar (Crimson-throated) barbet - Psilopogon malabaricus.